The end of summer doesn't mean that your lawn is safe from disease. Lawn diseases can appear year round, which is why it's vital to keep your lawn healthy no matter what the season! 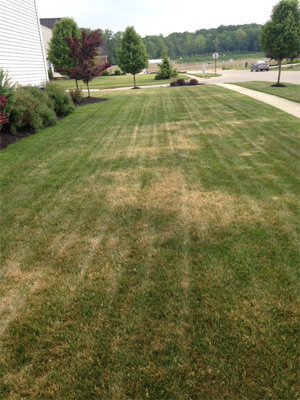 So what lawn diseases should you be aware of for the late summer and early fall? We have the list! Also known as cleavers, this weed usually becomes present in the late summer. It is very similar to crabgrass. Goose grass will grow in a “wagon wheel” shape and it can produce thousands of seeds, making it very difficult to control and get rid of. It’s thicker than regular grass blades and it has splayed tufts with finger-like blades. Goose grass can be hard to mow and it is usually spread by wind, which also makes it very hard to control. You can read about control and prevention methods for goose grass here. Dollar spot is a lawn fungus that is caused by Scerlotinia homeocarpa. This lawn disease will typically occur in clusters and it will change the color of your grass blades, turning them brown or tan. The spots usually are round and the size of a silver dollar (hence the name), but good news is that this disease will not affect the roots of your lawn. You can read more about controlling dollar spot here. You know those orange-brown specks on your lawn? The reason your shoes are orange? Yes that’s lawn rust. This disease will also attack the blades of your grass and the presence of it usually means that your lawn is low on nitrogen. You can check out more details about lawn rust here. The key to keeping any lawn healthy and green is proper maintenance! Follow proper mowing, watering, and fertilization techniques and your lawn will be less vulnerable to disease. Keeping your lawn healthy all year round is important. What you do in the fall for your lawn can help it have a healthy start for the spring. So what should you be doing this fall? You can check out our Fall Lawn Recovery Guide for all the tips! The FREE guide can help you keep your lawn healthy this fall and ready for the winter months. Download your FREE copy now!